In-fla-TOC-ra-cy (noun) 1. A new form of government of, by and for inflation. 2. Government that deliberately debases its paper money for social engineering, mind manipulation, wealth redistribution, secret taxation and seizing more power. The Inflatocracy, and the expanding welfare state it makes possible, have brought America to the brink of bankruptcy. 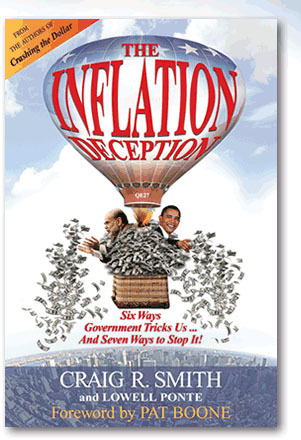 In THE INFLATION DECEPTION monetary expert and executive Craig R. Smith and former think tank futurist Lowell Ponte explain how the Inflatocracy took over our government. They offer three political and three financial ways to restore a free and prosperous America, and one personal way you can save your life savings and protect your family.